I painted Sedna in 1992 for Llewellyn's 1993 Goddess Calendar. She is included in the Goddess Oracle. Beside the arctic ocean, there once lived an old widower and his daughter, Sedna, a woman so beautiful that all the Eskimo men sought to live with her. But she found none to her liking and refused all offers. 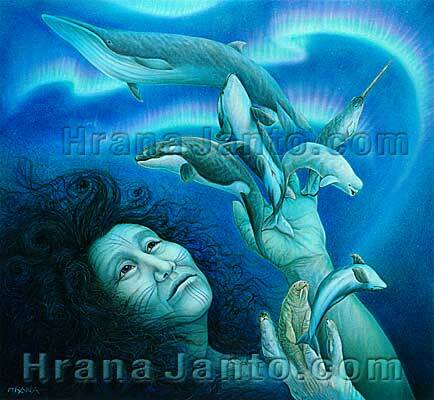 One day, a seabird came to her and promised her a soft life in a warm hut full of bearskins and fish. Sedna flew away with him. Anguta ("man with something to cut") put his daughter in his kayak to bring her back to the human world. Perhaps he killed the bird husband first, perhaps he just stole the bird's wife, but in either case the vengeance of the bird people followed him. The rising sea threatened the escaping humans with death. On they struggled, until Anguta realized that flight was hopeless. He shoved Sedna overboard to drown. Desperate for life, she grabbed the kayak with a fierce grip. Her father cut off her fingers. She flung her mutilated arms over the skin boat's sides. Anguta cut them off, shoving his oar into Sedna's eye before she sank into the icy water. At the bottom of the sea, she lived thereafter as queen of the deep, mistress of death and life, "old food dish," who provided for the people. Her amputated fingers and arms became the fish and marine mammals, and she alone decided how many could be slaughtered for food. She was willing to provide for the people if they accepted her rules: for three days after their death, the souls of her animals would remain with their bodies, watching for violation of Sedna's demands. Then they returned to the goddess, bearing information about the conduct of her people. Should her laws be broken, Sedna's hand would begin to ache, and she would punish humans with sickness, starvation, and storms. Only if a shaman traveled to her country, Adlivun, and assuaged her pains would the sea mammals return to the hunters, which, if the people acted righteously, they did willingly. In Adlivun in a huge house of stone and whale ribs, Sedna dragged along the ground with one leg bent beneath her. A horrible dog guarded her, said by some to be her husband. Anguta himself lived there too; some versions of the myth say that, hoping the seabirds would think Sedna dead, he allowed her back into the kayak and returned home. But she hated him thereafter and cursed her dogs to eat his hands and feet; the earth opened and swallowed them. In any case, Anguta served Sedna by grabbing dead human souls with his maimed hand and bringing them home. These dead lived in a region near Sedna's home through which shamans had to pass to reach the goddess. There was also an abyss, in which an ice wheel turned slowly and perpetually; then a caldron full of boiling seals blocked the way; finally, the horrible dog stood before Sedna's door, guarding the knife-thin passageway to her home. Should the shaman pass all these dangers and ease Sedna's aching hands, the goddess permitted him to return, bearing the news that Old Woman had forgiven her people, that the seals would again seek the hunter, that the people would no longer starve.